SUNSEEKER 70 2010 with SEAKEEPER. 2 X MAN V12 1360hp, 1050 hours. 2 X KOHLER 30kw & 20kw. RAYMARINE, SAT TV, UPGRATED sound system on fly bridge. NOVURANIA TENDER with 50hp Outboard. Providing unlimited open-air fun and sumptuous accommodation, the Manhattan 70 sets the standard for high-level entertainment, putting the emphasis on fun and excitement in Sunseekers inimitable style. Effortlessly blending luxury with practicality, the Manhattan 70 has a broad beam, graceful profile and extended cruising capabilities. En suite accommodation for eight and self-contained aft crew quarters make the Manhattan 70 a highly versatile vessel. 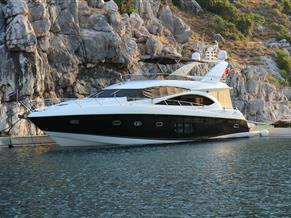 Please mention that you saw this boat on TheYachtMarket.